Flash at 8 weeks - he wont sit still for long enough to do this now....I have tried. He isn't playing! He weighed just over 1kg when we got him – he’s now a whopping* 1.9kg's. He has just about learnt his name - but only if there is nothing more interesting happening - and he's grasped sitting on command - esp. when food is involved! He will eat the most random foods. So far he’s loved blue cheese, hummus, tomatoes, cous cous, jam, strawberries, lettuce and wolfed it all down! But not celery or mushroom. Weirdo. One of his favourite things to do is bite you. Feet/hair/hands he’s not fussy, and even if he doesn't mean to be hurty bitey, those little puppy teeth are razor sharp. He’d mastered climbing our stairs after 2 weeks - which terrified me. But he can't get back down yet! He is a massive puppy whore and will charm everyone he comes in contact with – even people who don’t like dogs! He loves snuggling under the bed covers in a morning, especially after his walk. He thinks he’s billy big balls with older dogs, but playful little puppies scare him to bits. His favourite toy is whatever happens to distract him at that moment - puppy toy, empty bottle, hairbrush, mascara, snail - he's not fussy. He has learnt sitting at the boy's feet in the kitchen might sometimes result in food - it might be his favourite place to sit! If you want to pull at a gay pride festival – take Flash! If it rains, he won’t wee outside. Helpful in a horrible, rainy June. He doesn’t like walking on the lead much, but will trot alongside you quite happily in the park - once you get him there. He is a great cuddler - especially as he's falling asleep. And so as not to just post a stream of puppy pictures and make everyone think I am more crazy about him than I am - you can see some more pics here! That is so cute that you managed to once fit him into the scales! He would still fit, but he just wont sit still - even when he's half asleep. He just has too mush doganality! What a cutie! 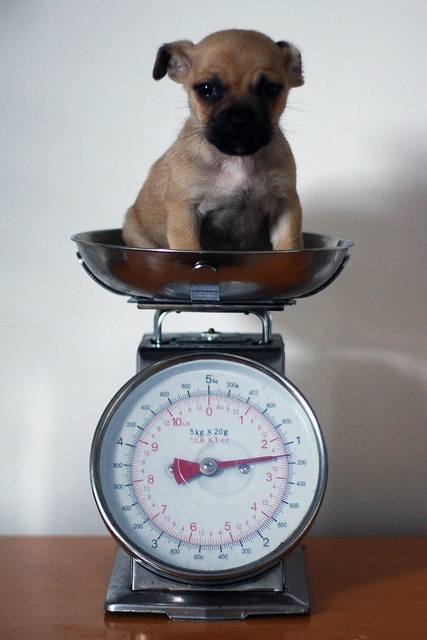 Love the puppy-in-scales photo.